Brička is traditional music fellowship from Latvia. The core of the group is a rare and unique accordion “ievinas” (after the constructor Augusts Ieviņš).The repertoire includes traditional Latvian dances from the beginning of the 20th Century. 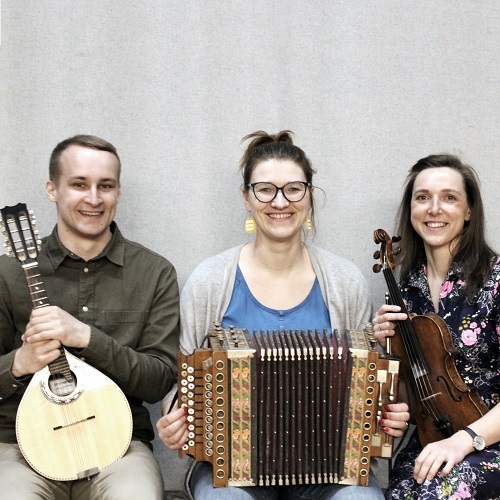 Līva and Līga have been playing together since 2016 and have been participating mostly in local dance evenings, folklore events and festivals. In addition, they organise their own dance festival “Rijas Balle” and actively take part in organising other events in their area. This year the two ladies are accompanied by Andris Rutkovskis on mandolin and drum.